Manufactured in Autriche from 1902 until Circa 1908. The R. Lechner (W. Müller) Neue Taschenkamera appeared in 1902, being advertised mostly in 1903, in periodicals such as the Photographisches Wochenblatt or the Photographisches Korrespondenz. 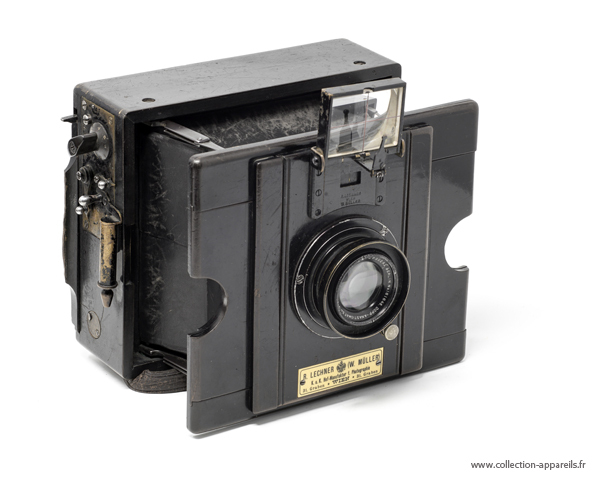 It substituted the Taschenkamera that had been released in 1895, still with wooden struts and an Anschütz type shutter. Lechner registered two patents for a focal plane shutter (AT5282 from 1900 and AT27137 from 1905). The first refers basically to the varying slit system, and the second to a full mechanism however not corresponding exactly to this camera. The Neue Taschenkamera focal plane shutter operates by controlling the slit width and allows time exposures. The release can be made directly or by pneumatic remote. The body is made of polish black wood and the bellows are un-pleated, and the handle is unusually located at the bottom of the camera. This camera was designed for 9 x 12 plates. A folding optical viewfinder with an articulated pointer is located on the top of the front standard. The lens is Goerz Dopp.-Anastigmat Serie IB Celor with 120 mm of focal length and maximum aperture of 4.8. The lensboard has vertical movement controlled by friction.